In December 2009 I started my blog on legal history, and every year I look back in particular to see how far I succeeded in “spanning centuries and continents”, a phrase I used in an early post. The number of gaps and omissions is perhaps not as large anymore as I had feared, but some subjects and themes seem to escape my attention, or they are definitely outside my range. This week I encountered a subject which reminded me how historians can avoid a subject not only for some sound technical reasons, but also like a kind of elephant in the room, very visible but nevertheless almost not to be mentioned. When studying Roman law we long to see its influence everywhere in the Roman world, but there is a state of mind in the Roman world we do not often mention, the awe of the Romans for Greek culture. A redesigned website about contracts in Greek law can perhaps help to put the balance right. Ancient Greek law seldom figures here, another reason to look at this interesting project. How should one approach ancient Greek law? Even when I did not dare to write about it here I have been aware of the very useful Nomoi portal for this vast subject, hosted by the Simon Fraser University. The Digital Classicist Wiki gives you a fair idea of digital projects concerning Classical Antiquity. For the latest news you can often reckon on the marvellous Ancient World Online blog (AWOL) which figured here prominently in a 2016 post about journals for ancient legal history. In a post about inscriptions I did mention projects on the rim of the Roman empire, but in fact all countries around the Mediterranean and in the Near East form the territories of Classical Antiquity. I did not hesitate to mention papyri in that post, too. In the project in the middle of this contribution a lot of themes come together: Greek law, inscriptions, papyri and Ptolemaic Egypt. The very title of the project Synallagma. Greek Contracts in Context goes with an explicit reference by its creator, Uri Yiftach (Tel Aviv University), to its earlier title, “Greek law in Roman times”, a phrase which indeed suggested Greek law is only a footnote or at its best a lesser relative of Roman law. Synallagma means originally mutual exchange. In the user guide and introduction Yiftach explains the working of this database with some 6,000 legal documents. With twelve fields you are able to filter for your specific search question. In the advanced search mode you can add search fields at will. In the overview of results the locations of documents, mainly in Egypt, take pride of place. Among the strengths of the Synallagma database are not only the references to the main overviews of inscriptions and papyri, but they will even directly link to them. You will see for example an embedded screen with information from Papyri.info, an aggregator of the main papyrological databases. These databases bring you to images, too. A very useful function is the clauses section which distinguishes the elements of a contract. In the start screen you can select from twelve contract categories. You can set the presentation of search results in various orders. Thus it is easy to ascertain for example the first occurrence of a cheirographon in 247 BCE, and its latest in the eighth century CE, or to filter for contracts with women as one of the parties involved, in 1220 items. The drop down menu for gender includes also a couple, groups and forms of incorporation. Acts of sale dominate with 2820 items, followed by petitions and applications. some 2,500 items, nearly 1,600 lease contracts, and nearly 1,400 loans and deposits. The sum is higher than the total of 6,000 items, and one can readily assume the petitions concern all kind of contracts. There are 420 laws and decrees. I was intrigued by the testamentary dispositions (235 items) in the Synallagma database. When I saw two of them stem from Ravenna in the sixth century CE I could not help being greatly interested from the perspective of Roman law. Alas the two papyri, P.Ital.-01-00004-and 5, dated 552-575, and P.Ital. 01-00006 from 575 did not show up correctly at first in Synallagma. At Papyri.info only P.Ital. 1.4-5 (ChLA 17.653) is present. P.Ital I refers to the edition by Jan-Olof Tjäder, Die nichtliterarischen lateinischen Papyri Italiens aus der Zeit 445-700 (Lund 1955). In the Trismegistos database (TM) P. Ital. 1-6 (ChLA 2.714) is recorded as a Latin text in Greek script. ChLA stands for Chartae Latinae Antiquiores, and you can search for items in ChLA using an online database. Synallagma notes two other documents from Ravenna. The first is P. Rain. Cent. 166 / ChLA 45.1346 = P. Ital I 10 = TM 35870, a Latin act of sale from the sixth or seventh century CE, digitized at Vienna. 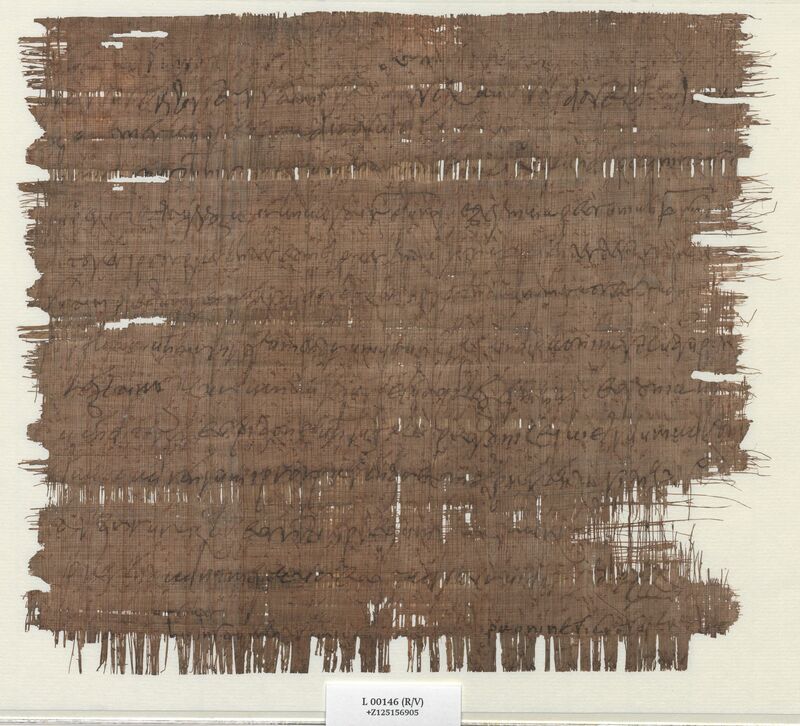 Another act of sale from 151 CE (SB 6 304, TM 18822) in a papyrus held at Giessen which turns out to be a wax tablet, written in Latin with passages in Greek script. You can read about it online in a study by Hans Georg Gundel, Antiker Kaufvertrag auf einer Wachstafel aus Ravenna (Giessen 1960). Papyri.info has a checklist for the most used editions and their abbreviations. I have on purpose expanded some of these references to papyri, but in fact I left much more out as you can check yourself. Recently appeared a volume of essays with the title Ravenna: its role in earlier medieval change and exchange (London 2016), edited by Judith Herrin and Jinty Nelson, now put online in open access by the School of Advanced Study in London. Simon Corcoran contributed an article on ‘Roman law in Ravenna’ (pp. 163-198) and looked also at the evidence of papyri. Trismegistos makes it very clear that many hundred papyri stem from Ravenna, but only 70 are dated later than 400 CE. One of the few quibbles I have with Synallagma is the absence of a possibility to save your results. No doubt such features are present for those who register with the project, and do not stay content with the guest access I used. You can frown on me for leaving Synallagma so quickly for the lures of papyrological databases, and eventually even for Roman law, but we should admit Synallagma inspires you to check such resources and link them with your own favorite subjects. As for linking places with objects I cannot help adding here a link to Peripleo, the latest jewel in the crown of the Pelagios initiative. It offers nothing less than an interactive map where you can click on modern and ancient locations to find objects from Classical Antiquity associated with them. Miraculously there is no direct entry for Ravenna, but in one of its supporting resources, the Pleiades gazetteer, it is present, clearly a case of oversight. You might feel sometimes almost sick from manoeuvring from one site to another, but did scholars not use to work with piles of books in front of them to find their way? By patiently combining and comparing information, and as often as possible looking at projects or studies with a very particular search angle such as Synallagma, you can build slowly and cautiously but also consistently. Hopefully such resources will surprise you also every now and then with insights that help you decisively. This entry was posted in Scholars and tagged Ancient law, Classical Antiquity, Egypt, Epigraphy, Greek law, Legal history, Papyrology, Roman law on December 6, 2017 by rechtsgeschiedenis.